The Fire Weather Index (FWI) System is the first part of the Canadian Forest Fire Danger Rating System (CFFDRS) introduced into New Zealand in 1980. It has proved to be a suitable fire danger rating system for this country. The FWI was evaluated for several seasons before it was introduced for the 1980-81 fire season. 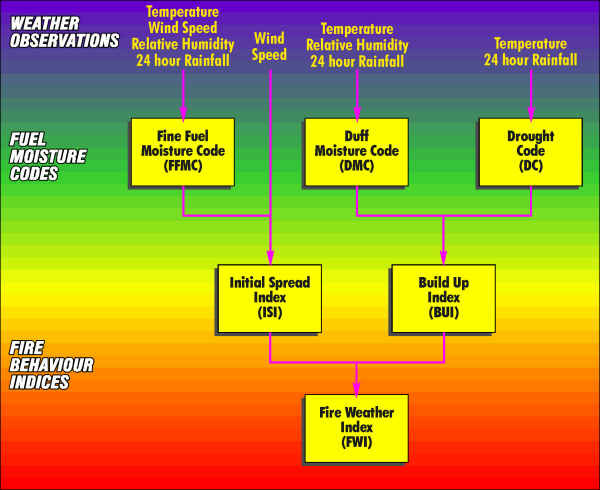 The fire weather index calculation structure. To interpret the system the three fuel moisture codes and the three behaviour indices need to be understood. Each code and index is a numerical rating related to likely fire behaviour. The scales start at zero, and except for the Fine Fuel Moisture Code which has a maximum of 99, all are open-ended. Low ratings indicate high moisture content, and ratings rise as moisture content decreases. Ratings rise as fire weather becomes more severe. The FWI System evaluates fuel moisture content and relative fire behaviour using past and present weather effects on ground level fuels. The moisture codes reflect the nett effects of daily moisture gains and losses. The three behaviour indices are relative to the fuel moisture content. They indicate what a fire is likely to do. The lower the moisture content, the higher the Fuel Moisture Codes, and the higher the Fire Behaviour Indices - and the more active the fire will be. The FWI is further refined into indices that represent the Fire Intensity likely in the three vegetation types (Forest, Scrub & Grasses). These three codes are divided into five fire danger classes (Low, Moderate, High, Very high & Extreme) and calculate the fire intensity in kilowatts per square metre (kw/m2). Based on predicted generated "fire intensity (kw/m2)" in highly flammable forest type vegetation (conifer, eucalypt). This code denotes how difficult it would be to control a fire in this vegetation type should one start. Based on predicted generated "fire intensity (kw/m2)" in flammable scrub type vegetation (tea tree, broom, gorse, manuka). This code denotes how difficult it would be to control a fire in this vegetation type should one start. Based on predicted generated "fire intensity (kw/m2)" in grass type vegetation (dry grass, tussock). This code denotes how difficult it would be to control a fire in this vegetation type should one start. 1. The moisture codes (FFMC, DMC and DC) indicate what fuels will be involved and their ease of ignition. This will vary during the season. Each code must be considered to assess potential burning characteristics. 2. The fire behaviour indices (ISI, BUI, FWI) indicate the likely initial spread, total fuel availability, and potential intensity. In general terms, a hot, but slow moving fire. The type of fire likely to occur on a windless day in mid-summer after a long dry period. Note the same FWI as example 3. In general, a fast moving fire involving fine fuels only.